Eric Williams, the Executive Director of CT NORML, and professional lobbyist, reports live from the State Legislative hearings, awaiting the vote to come in for the new Medical Marijuana Bill for the state of Connecticut. The bill raises many eyebrows, as some of the surprising details come to light. One of the biggest things learned from Eric was the fact that you have to READ the bills you support. 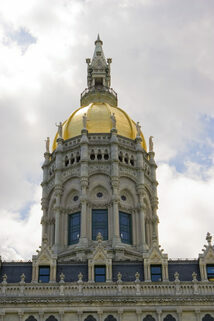 Although Connecticut has passed the medical marijuana bill, there are some red flags in it that supporters should have addressed. For instance why is a million dollar escrow account required, when the local drug store has no escrow? Why are the licensing fees excessive, when the local drug stores pay a couple hundred dollars? Why are the limits so stringent on non-toxic marijuana, when toxic prescription drugs are so widely available? Why is there a requirement that only a licensed pharmacist can dispense marijuana, when the DEA regulates licensing of pharmacists,and clearly the DEA is serious about arresting dispensaries and patients for dispensing and using marijuana as evidenced by the raids on dispensaries nationwide? What pharmacist is going to stick their neck out to fill an order for marijuana when their license is issued by the same people who have blocked medical research and falsely claim their is no medical benefit? Since the DEA has marijuana listed as a Schedule 1 drug, which means that it is suppose to not have any medical benefits, (according to the DEA... although this is laughable since the Federal Govt. has been supplying patients medical marijuana for decades), the pharmacist would be violating the dispensing rule. This legislation was sponsored by NORML, who many marijuana advocates have come to despise for a wide variety of reasons. It seems legislation such as this is part of the reason advocates who are aware of the ongoing behind the scenes deal making and comments are not fans of NORML. No matter what state you live in, there is a very big lesson to be learned from all of this, and that is, READ READ, READ the legislation before you support it. And call and write your representatives and let them know why a piece of a bill should be changed. Another trick lawmakers use is misleading titles to bills. Just because a bill is titled as "legalization" or "reform" or any other flowery title such as the "food safey modernization act" don't assume everything in the bill is beneficial. Big corporations have taken control with hordes of lawyers that write laws to gain market share. And as with most things, loss of control to a very small group is not a good thing. Why? Eventually the price increases and the money flows to a very small group of people. The rich get richer and the middle class dwindles in debt. Hey, who doesn't agree with "food safety and modernization"? Sounds great right? Well, it is just one example of a bill title, that was loaded with rules limiting growing your own food or selling home grown food at farmers markets, and also placed enormous burdens on small organic mom and pop farms. In other words there was language that made it very difficult for small family farms to sustain themselves. If people had not been paying attention, passing the bill in its original form could have had devastating effects from many perspectives. But if you only read the title, it sounds good huh? Titles of bills are very often used to trick people into supporting legislation that they would not agree to if they read the entire bill. Demand better of the organizations you support, and demand better of the legislators that are suppose to be representing you, not their big business buddies. As they say, follow the money. And bringing up the "food safety and modernization act" is relevant as marijuana is also food. Some patients are juicing marijuana fresh from the garden and reporting fantastic health benefits, and healing. Amazingly there is no "high" or psychoactive effect associated with eating freshly juiced marijuana since THC (the cannabinoid that results in the high effect) doesn't form until the marijuana is dried. Freshly picked marijuana contains THCA, and CBDA, both acidic forms of the cannabinoids in marijuana that have medicinal properties without the high. Yet another reason home growing should be allowed, so fresh marijuana is available straight from the garden to promote healing and maintain health.